It was 8:30 p.m., and we had hopped two monorails to get to Epcot after arriving just a few hours earlier at The Contemporary Hotel in the Magic Kingdom. We were late for our reservation at the Biergarten in Epcot’s Germany Pavilion, and people were packing themselves in like beached sardines around the edge of the World Showcase Lagoon to get a good spot for IllumiNations, a jaw-dropping extravaganza of lights and fireworks that takes place on the lagoon most evenings at 9:00. Our situation that evening epitomized the yin and yang of visiting WDW: the phenomenal beauty and spectacle of what Disney has to offer, contrasted with the beastliness of grappling with the incredible logistics coordination while all the while maintaining boatloads of patience and unlimited reserves of energy in order to make the trip work. So, to ensure that our family did not spend four and a half days existing primarily on burgers, cold chicken wraps and mouse-shaped ice cream on a stick, several weeks before our trip, I reserved three “sit-down” meals through the Dining page of the official Walt Disney World website. After all that planning, I wasn’t going to let our first night’s reservation go to waste. (And besides, Disney charges $20 a head for missing a reservation. Ouch!) So grabbing my daughter’s hand, we sprinted through the crowds, out ahead of my husband and son, in search of the Biergarten. Surely we would find Germany near the United Kingdom or France, I thought as we wove through the mouse-eared masses. But somehow when we stopped for a breath we were instead in the middle of Japan—a little surreal. By now we had trekked all the way to the opposite end of the park. A helpful shopkeeper encouraged us to keep on going, (Only two more pavilions to go!) and we finally arrived in Deutschland. The jung damens at the Biergarten hostess podium were unphased by our late arrival time. And once we were seated, all our grumbliness began to fade. The interior of Biergarten has the look of a Hollywood sound stage from the Technicolor era, a perpetual Oktoberfest celebration at which you are seated “open-air” at communal tables in the midst of a bucolic German village. 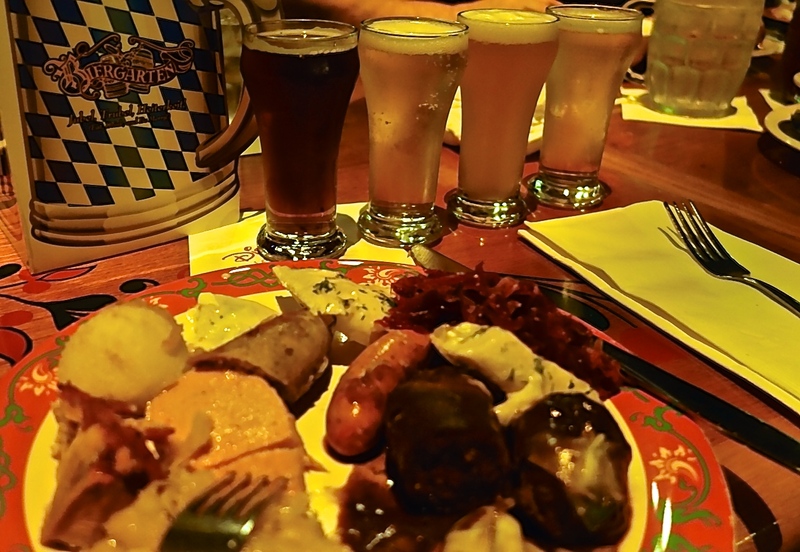 After running around in the dark in the 80-something degree Orlando heat for the last hour, the tasting flight of German beers on the menu sounded heavenly. My favorite, the Hovels Original, was a rich, amber-colored beer with both caramel and citrus notes. Hearty, yet refreshing. Eating from any buffet near closing time can be a bleak and unsavory prospect, but the plentiful assortment of German classics was very appealing. 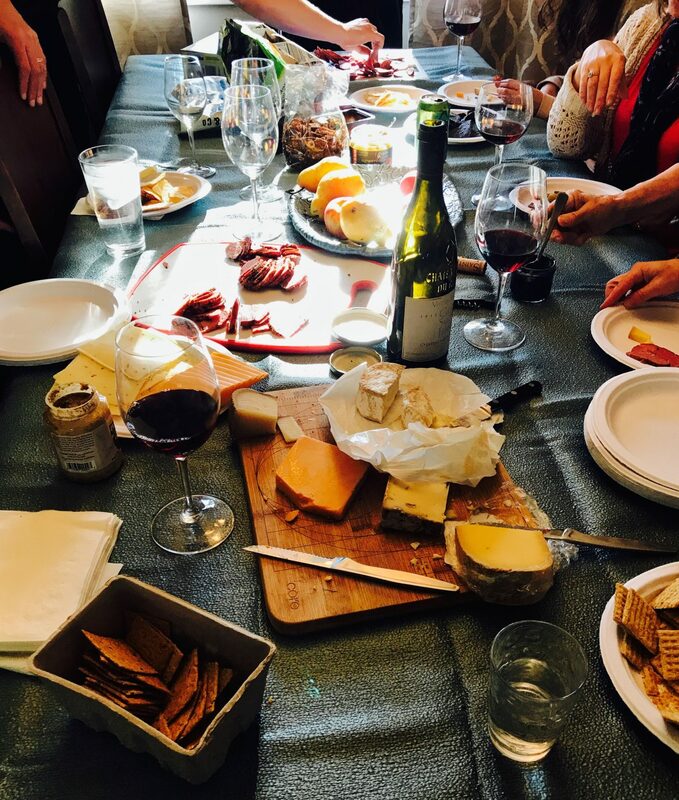 We piled our plates with schnitzel, bratwurst, sauerbraten, sauerkraut, braised red cabbage (rotkohl), pickled herring, warm German potato salad, spaetzel, potato dumplings, chilled charcuterie, cheeses, and apple streudel. Name a German favorite, and it was there. Add to this a regular lineup of musical performances by oompah bands and alpenhorns, and a meal at Biergarten is one boisterous and satisfying repast. We left the park with a new lease on life that evening. The ride back to the hotel was quite placid. That’s what a belly full of beer and German comfort food will do for you. When you’re up before dawn so that you can be standing at the front of the Magic Kingdom rope line, your heart’s fondest wish is for a stout cup of java. But unless you have a fairy godmother who can conjure a latte out of thin air, you’ll need to search a bit to find good coffee at WDW. There are only two Starbucks to be found within the actual parks themselves, one in the Magic Kingdom, one in Epcot. So you can imagine the perpetual queue at each of them. (Is there a FastPass for coffee?) As we bolted through the entrance that morning on the way to The Seven Dwarves Mine Train, I could already see the line snaking out the door at the Starbuck’s on Main Street in the Magic Kingdom. “We’re only here to get coffee,” I overheard one woman say. Egad! 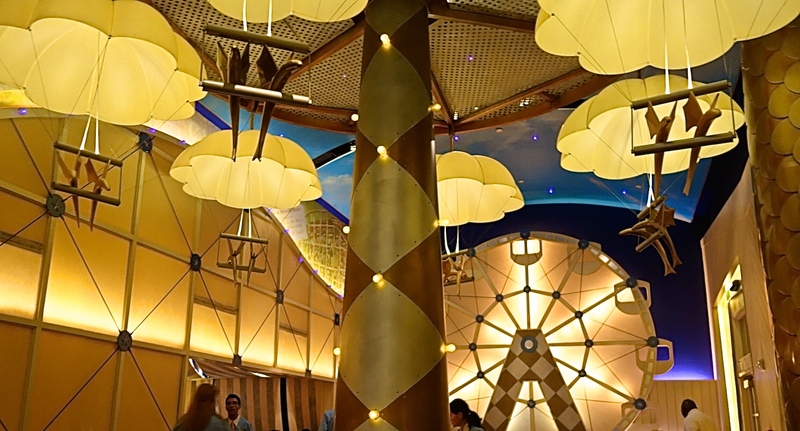 There are other places in the France Pavilion, as well as Italy and Canada, that you can give a whirl. But my life saver each morning turned out to be an unassuming coffee kiosk with locations in every one of the WDW parks as well as select Disney hotels and fine dining restaurants. Joffrey’s Coffee & Tea Company is the official specialty coffee provider for Disney. The Tampa-based coffee company roasts its own line of customized blends for Disney. You can order a particular restaurant’s blend from the Joffrey’s website too. After we found Joffrey’s, we could rest assured that no matter which park we were visiting, good coffee and espresso drinks would be close at hand. You may want a cup to help you endure the line that stretches from here to eternity to ride The Tower of Terror at Disney’s Hollywood Studios. So it was hamburgers and veggie burgers for lunch (Yes, Disney menus offer vegetarian choices. ), then on with the day. This was fine, because when you’re in the Magic Kingdom, there’s way too much going on to want to sit in one place more than 20 minutes for any reason. We saved our leisurely meal for the evening. That night, we took it up a notch…several notches, at Flying Fish Cafe, an upscale seafood restaurant located in Disney’s BoardWalk area. The BoardWalk is an entertainment, shopping and dining complex located on Crescent Lake, between Epcot and Hollywood Studios. The only drawback to eating dinner there was the prospect of a long bus ride, the only direct Disney transportation to the BoardWalk from the Magic Kingdom where were staying. Since the night was already a splurge, we gave in and called a cab both ways. At night the lakefront is a lovely place for a stroll. While we waited for our table, we window shopped then played video games in a small arcade attached to the ESPN Club, a sports bar just down the way from our restaurant. Eating at Flying Fish is an event. It’s the kind of place where the menu changes daily, the seafood is either flown in from prime locations throughout the world or locally sourced from nearby coastal waters. Many of the greens and vegetables are grown in the greenhouses of Epcot’s Land Pavilion. The wine list includes some well-researched treasures. We started with fried calamari and shrimp. The light, crispy batter allowed the mild flavors of the tender seafood to shine. We skipped the accompanying “Asian-inspired” sauce, which did not prove to be up to the task of enhancing something already so delicious. Ravenous from the day’s adventures, our family swooped in, and the platter was empty in no time. 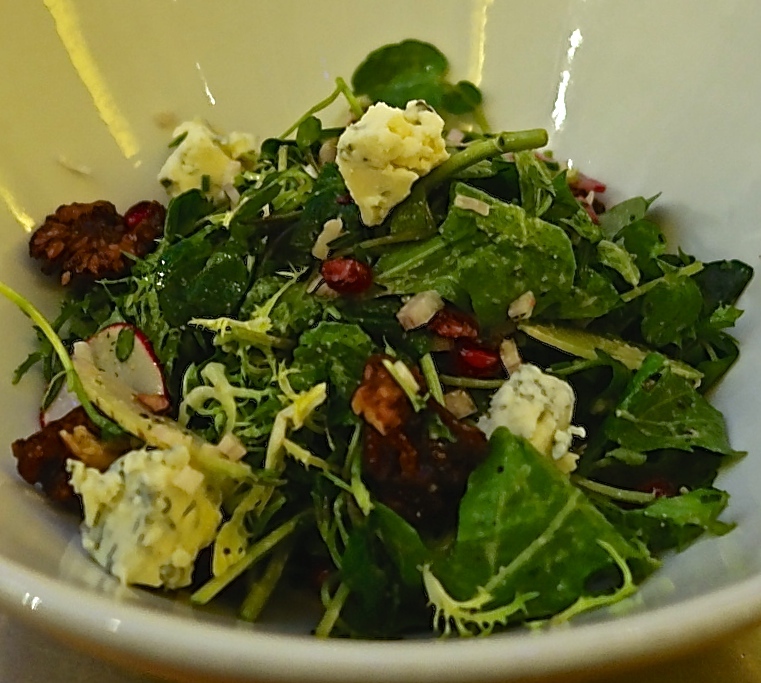 John and I split a salad of arugula and watercress, full of candied walnuts, large chunks of creamy gorgonzola, shaved radishes, and a smattering of pomegranate seeds, all lightly dressed in a walnut oil vinaigrette. Opal Basil, Fennel, Caper, Olive, Golden Raisin and Pine Nut-laced Epcot Land Pavilion Eggplant Caponata Siciliana with a Lake Meadow Naturals Poached Egg. Each item on the menu comes with a pairing recommendation. I’m a big fan of French Pinot Noir, so I went with the suggested 2009 Domaine Blain-Gagnard, Chassagne-Montrachet Burgundy. Well-structured, full of raspberry and a hint of spice, it worked magic with my pepper-crusted tuna filet. 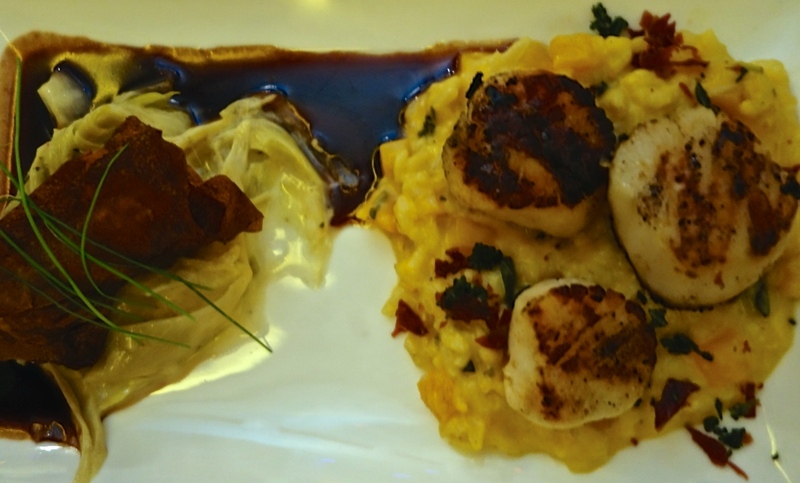 The Oak-Grilled Maine Sea Scallops were presented on a bed of fluffy Mascarpone risotto, along with the restaurant’s signature crispy potato-wrapped red snapper, served atop a leek fondue. 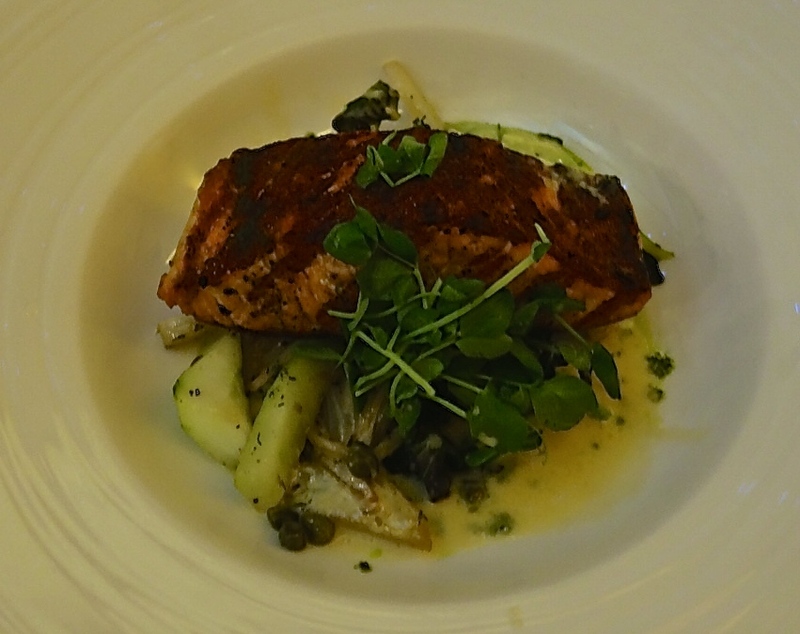 Blacks Harbour True North Salmon, reclining on a cushion of watercress, sweet Vidalia onion and fennel confit, was served alongside thick slices of Epcot cucumbers. 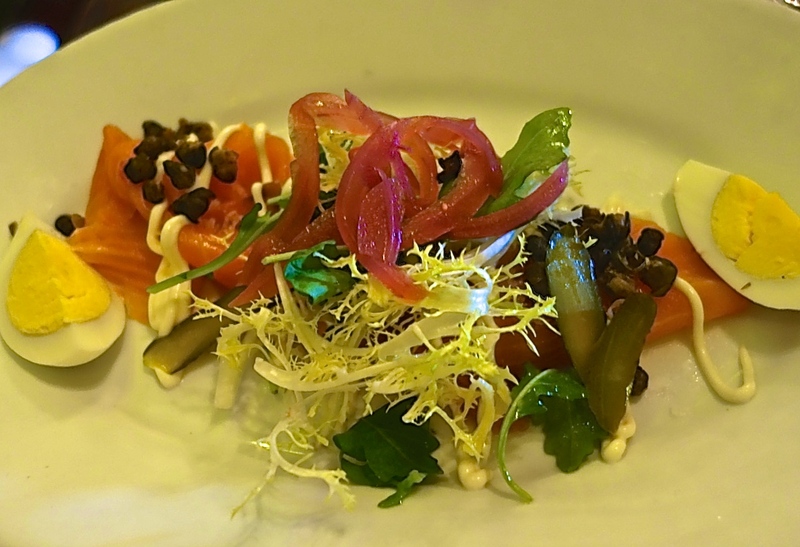 Other Disney fine dining possibilities include Jiko in the Animal Kingdom Lodge, Victoria and Albert at Grand Floridian Resort & Spa, and in Epcot’s World Showcase, Monsieur Paul in the France Pavilion, and Le Cellier in the Canada Pavilion. If you would like to live it up at one of these well-reviewed, upscale Disney restaurants, keep in mind that to ensure your spot at the table, your best bet is to make the reservation very early through the the Walt Disney World website, up to 180 days before the desired date. Baby, it was cold outside the day we made it back to Epcot. (Florida weather can be quite erratic at this time of year.) 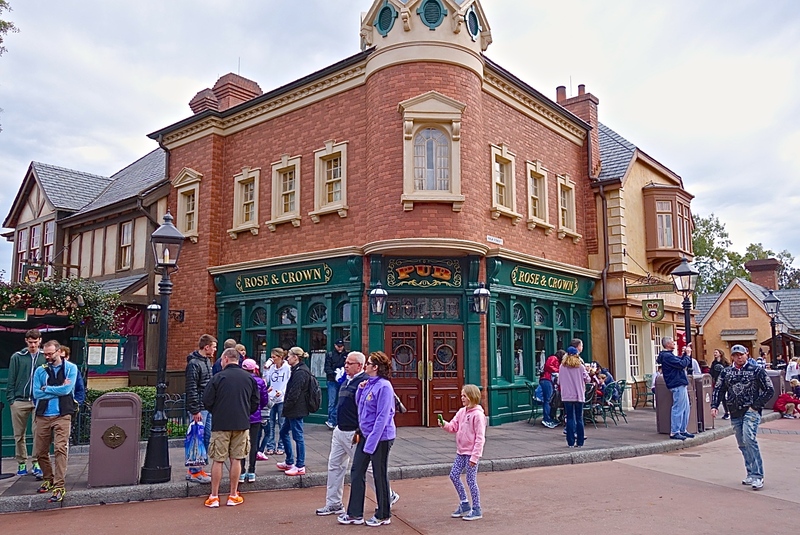 Our lunch reservation was at the Rose and Crown pub in the United Kingdom Pavilion. It was too cold to hang around at the outside check-in counter, so we stepped inside and ordered a couple of pints at the bar while we waited for the pager to go off. I could have sat there for an hour just enjoying the warmth and the convivial conversation of the British bartender. 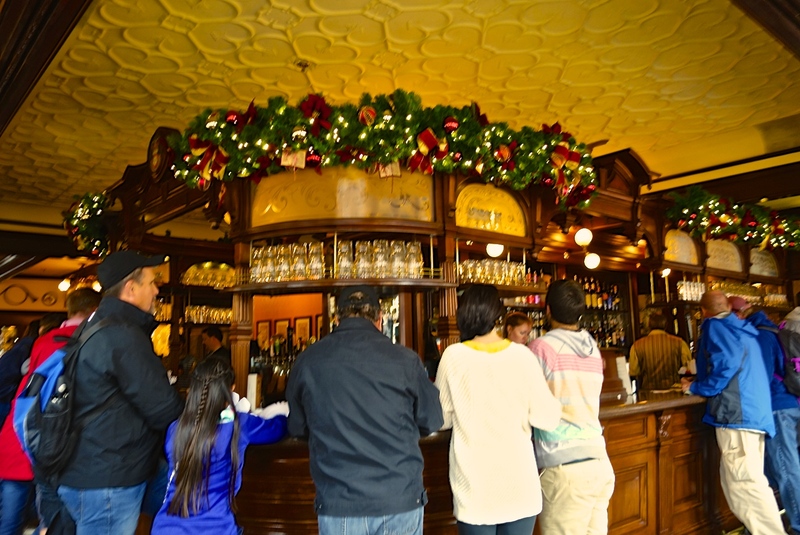 The place had a look and feel of authenticity: the handsome dark wood paneling, the patterned ceiling, all decked out in Christmas garland, lights and fat red bows. Rose and Crown offers a substantial list of ales, ciders, lagers and stouts. I chose a Boddingtons Pub Ale, and John ordered one of his favorites, a black and tan (half Bass Ale, half Guiness). Soon we were seated in the adjoining dining area. Our server was from the Jersey Isles. 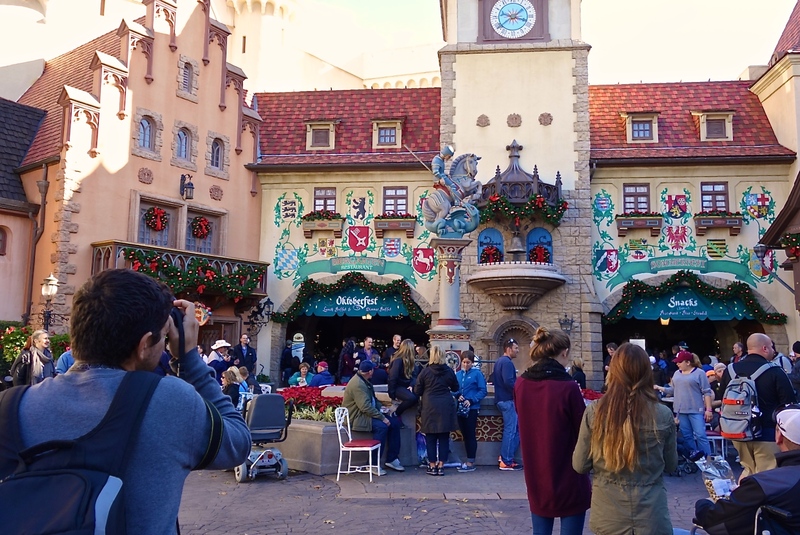 In fact, the Disney employees (or “Cast Members,” as they are called) for each pavilion that we visited were from the actual countries they were representing in the World Showcase. 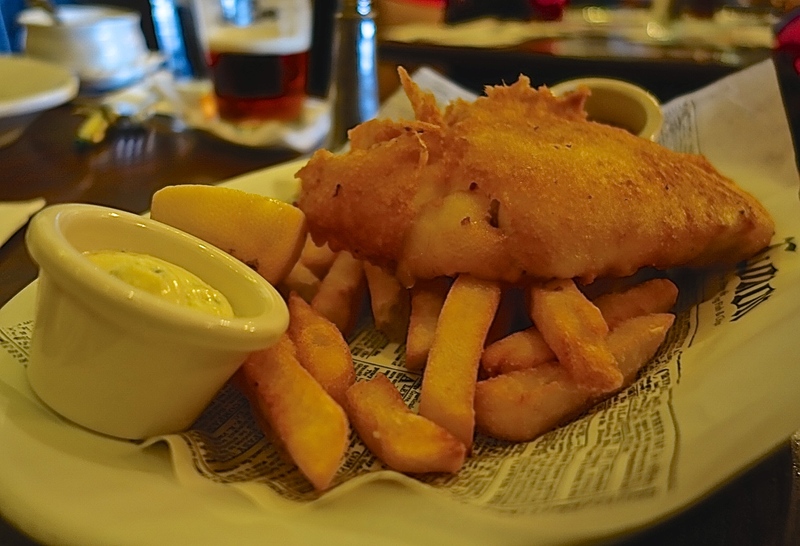 Rose and Crown serves classic British pub fare and other U.K. favorites. 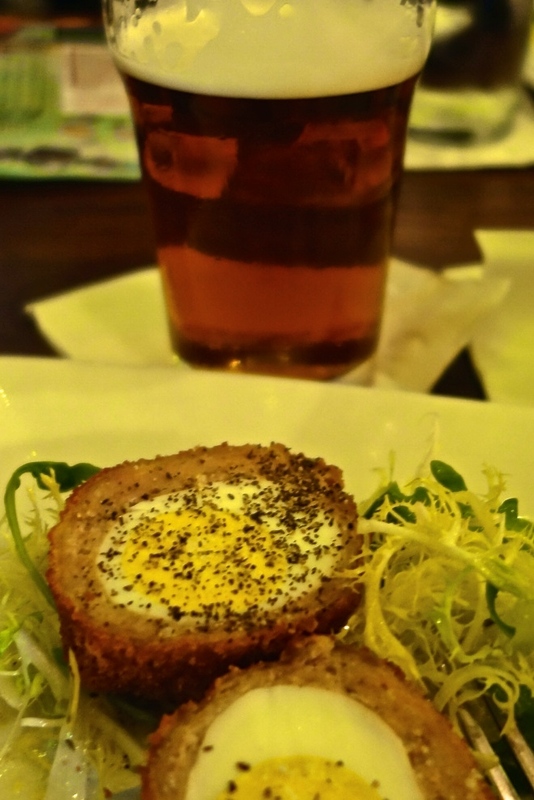 We started our meal with smoked Scottish salmon and a couple of orders of Scotch eggs, which we had never tried before. The eggs are boiled, then covered in loose sausage and fried until the outside is crispy. These were served on a bed of fresh greens with a dollop of mustard sauce on the side. We could have ordered another round of these starters and left satisfied. When our entrees arrived, John shared a bite of what seemed a very proper representation of fish and chips, served on a traditional bed of “newsprint.” Both the fish and the potatoes were fried quite well and were very tasty. My son ordered tikka masala, that Indo/British hybrid dish consisting of chicken in a somewhat spicy sauce usually made with yogurt, tomato and coriander. 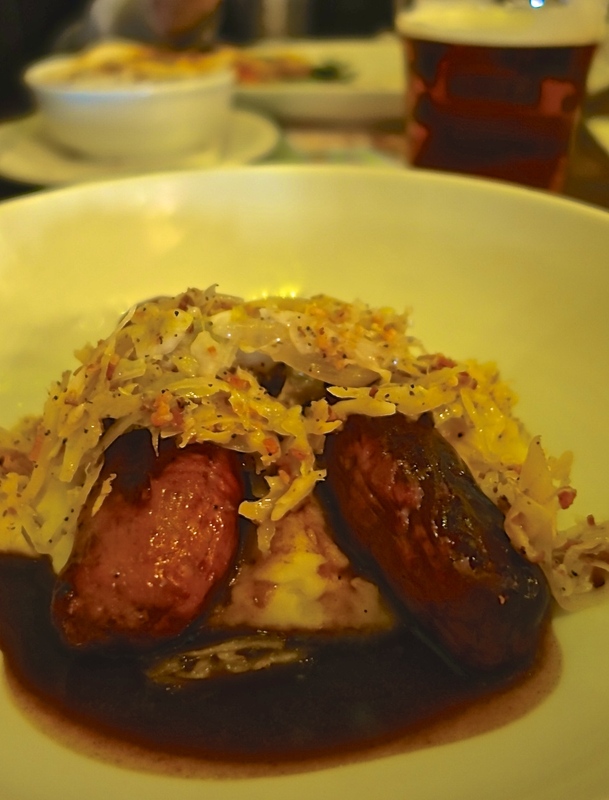 I had the famous bangers and mash–sausages, braised cabbage and mashed potatoes in gravy. Everything we ordered was prepared well. 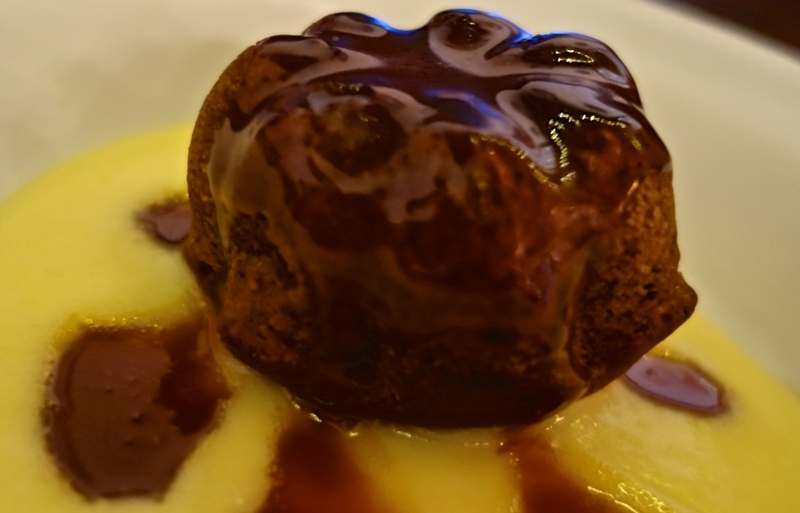 We finished with sticky toffee pudding–steamed sponge cake made with dates, topped with toffee sauce, surrounded by a rich pool of warm vanilla rum custard. So good that I am ordering this for dessert anywhere that I am lucky enough to see it on a menu again. It was a relaxing lunch, no one pushing us to leave, even though there was a persistent line of people outside waiting for a table. This stick-to-your-ribs meal took us through the rest of our tour of Epcot and well into the evening. If you enter the experience of dining in the World Showcase without expecting the cuisine to reach these heights, but rather, with an appreciation of the entire experience– the food items, such as cheeses and beverages, that are often imported, an informed “home country” waitstaff, the attention to detail in putting together the atmospherics of each restaurant–you’re going to have a great old time. I found the food to be quite good, especially keeping in mind the spirit in which it is intended. And much of it is as good or better than some restaurants where I live that offer these same cuisines. Yes, the prices are a little stiff, but, again, you are part of a captive audience in a theme park, and the prices should not be an astonishment. Food was only a single element of our trip to Walt Disney World, but it was a memorable one. Think about the ocean of difference between dining at Disney and eating at another theme park. Appreciate that the best you might hope for anywhere else is non-surly service and a corn dog that hasn’t been sitting in a warmer since last Tuesday. Disney knows that we all make the trek to Orlando because we share an innate desire for our senses to somehow be delighted, to have someone suspend our disbelief and make it possible for us to live out a magical adventure, if only for a short while. But even with the master of fantasy behind the helm, it only works if the audience is willing. P.S. 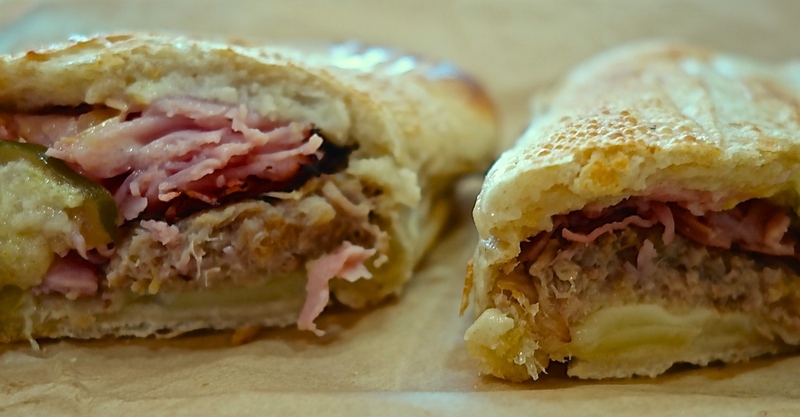 : On your way home, at the Orlando International Airport, you can’t go wrong with a Cubano sandwich and fresh roasted coffee from Zaza Cuban Cafe & Coffee. There’s lively music, a smiling waitstaff, and, best of all, a sandwich press churning out hot Cuban sandwiches on exquisitely chewy-crisp bread, so enticing that I ordered one for breakfast along with a cappuccino before boarding the plane home. The crusty warm bread, the salty tang of those savory meats, and the aroma of that steaming hot coffee (Zaza roasts it themselves)–a fitting close to a trip full of delights, big and small.